Key difference: C++ is a general-purpose programming language. It is also developed from the original C programming language. C++ is a type of object-oriented programming (OOP) language. OOP is a programming paradigm. In OOP, each object is capable of receiving messages, processing data, and sending messages to other objects. Hence, each object is independent and has a distinct role or responsibility. C++ is a general-purpose programming language. It is also developed from the original C programming language. It was developed by Bjarne Stroustrup at Bell Labs starting in 1979. C++ was originally named C with Classes. It was renamed C++ in 1983. C++ is a statically typed, free-form, multi-paradigm and a compiled programming language. The C++ programming language is widely considered to be an intermediate-level language, as it made up of both high-level and low-level language features. As compared to C, C++ incorporates object oriented features, such as classes, and other enhancements. C++ has taken over some of the popularity of the C language. C++ is now currently implemented on a wide variety of hardware and operating system platforms. It is considered to be an efficient compiler to native code. It also incorporates systems software, application software, device drivers, embedded software, high-performance server and client applications as part of its application domains, as well as entertainment software such as video games. C++ originally started out as an enhancement to C. It was designed to be source-and-link compatible with C. It added classes, virtual functions, operator overloading, multiple inheritance, templates, exception handling, etc. However, it eventually developed enough to be considered a programming language in its own right. It was originally ratified in 1998 as ISO/IEC 14882:1998. C++ is now commonly used for hardware design. The design is first described in C++. It is then analyzed, architecturally constrained, and scheduled to create a register-transfer level hardware description language. It would do this through high-level synthesis. Both free and proprietary C++ compiler software is available in the market. Some examples of these software include the GNU Project, Microsoft, Intel and Embarcadero Technologies. 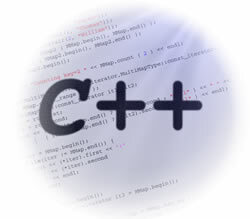 C++ has also had a major influence on other programming languages such as C# (C Sharp) and Java. C++ is a type of object-oriented programming (OOP) language. OOP is a programming paradigm. In OOP, each object is capable of receiving messages, processing data, and sending messages to other objects. Hence, each object is independent and has a distinct role or responsibility. OOP represents concepts as objects that have data fields. Data fields are basically attributes that describe the object. The procedures associated with the objects are known as methods. OOP places the data where it is not directly accessible by the rest of the program. Methods are the only way that this data can be assessed. The objects, which are usually instances of classes, are used to interact with one another to design applications and computer programs. Java is another type of object-oriented programming (OOP) language. OOP differs from the procedure oriented programming (POP) as it is a collection of interacting objects. POP, on the other hand, is a list of tasks to be performed, also known as subroutines. The major difference between C++ and OOP is that that C++ is a type of OOP language. It is based on the structure of OOP. OOP is a concept, while C++ is its programming application.